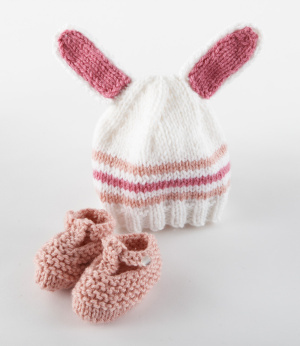 This cute free knitting pattern for a bunny hat and booties from Lion Brand Yarn via Craft Foxes would make a really cute baby gift for a newborn, or make the larger hat size for a toddler to wear in the spring when there’s still a chill in the air. The patterns call for Vanna’s Choice yarn, but of course you could use whatever medium weight yarn you have on hand (and make them wool to provide even more warmth for your little bunny). Both the hat and the bootie are worked flat, folded and seamed, making them easy projects for newer knitters who don’t want to deal with knitting in the round (or all those pointy double-pointed needles). And of course if you didn’t want bunny ears, you could knit the hat without embellishment. Or try making dog ears, bear ears or any other kind of animal ears that suit you.